Goodbye, 2014! It has been fun! Happy New Year's Eve, Trendy Twine family! It is Jessi from Kissin' Krafts! Let start over the celebrations with a simple, fun card that anyone can create! All month, I have been showcasing the fun and festive Cherry Limeade! So for this project, I decided to take the twine apart and work with the two colors. As I unwind the twine, I fell in love with the crinkle look it started to create. Once the colors were separate, create two circles on the card front. On top of the twine, I placed a die cut word. To finish the card, I used stickers to create the rest of the sentiment. 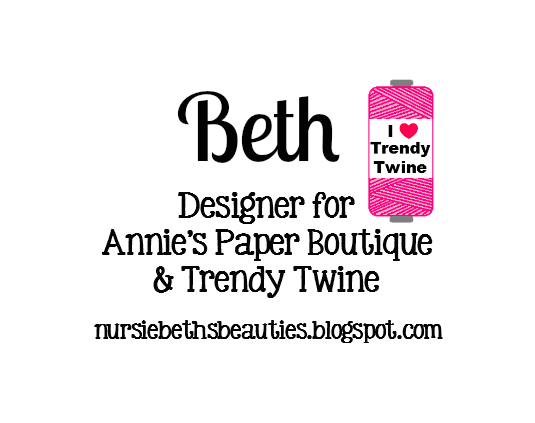 Have you joined our Facebook group, Twine It Up? 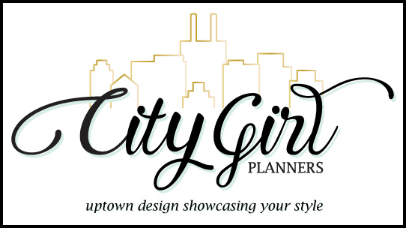 We would love for you to join and show off your own creations! See you next year! Have a safe and wonderful evening! This is Shelly from My Paper Love stopping in to share a sweet little gift I made for a few SUPER special friends this Christmas. I started with one of Trendy's awesome Christmas Twines Frosted Cranberry and a great Clear candy sacks, so perfect for my little treat! I found some really cute ideas on pinterest and in the end I chose this sentiment. "For your Mistle toes". I die cut a tag and printed the sentiment from my computer and added some gorgeous Frosted Cranberry . Such a simple treat that I hope my friends will love! Thank for stopping in and hope you have a GREAT day! It's Tammy, and I hope you had a wonderful holiday!! With all the presents opened, it's time to show appreciation for those presents that were carefully picked out during this wonderful time of year. I'm using Holly Berry Trendy Twine in my Thank You card today as well as a Holly leaf and die to keep the Holiday Spirit alive just a little longer. It's the perfect way to get more mileage out of your seasonal products. I started with a Forest Green card base onto which I adhered my white cardstock after rounding the corners. 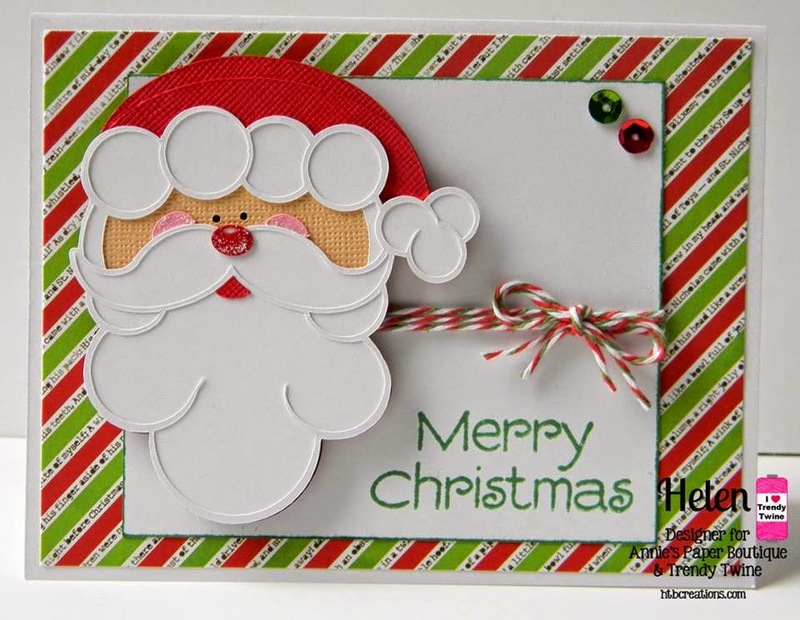 Next I took a red and the red and green diagonal stripe paper and added a scallop border to the bottom and layered them to the bottom of my card front. Taking a thin red satin ribbon from my stash, I added it to the top of the papers to create a finished border. Next I wrapped the Holly Berry Trendy Twine several times around the card front. A fussy seam binding bow was created and embellished with a button and double Holly Berry Trendy Twine bow. 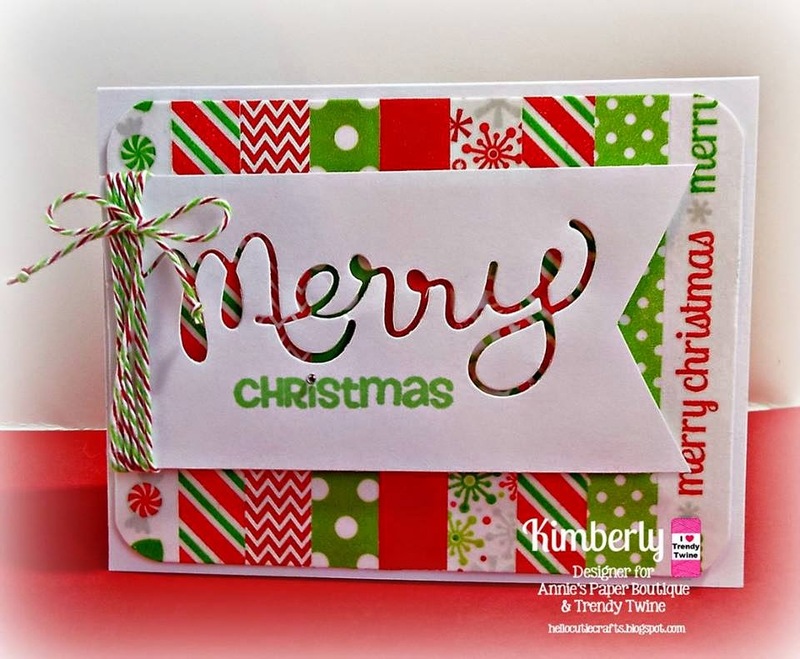 The Thank You sentiment was stamped in green ink to the right of the bow adding the die-cut Holly Leaves just above. To add a little glitz, I added some Sickles to the leaves. Lastly, a few enamel dots were added to the upper left corner. Thank you for dropping by today! Please be sure to visit the Twine It Up! Facebook Group where you can be inspired by other Trendy Twine users and find exclusive deals just for this group! As always, you can find the fabulous products in the store - HERE! The DT wanted to share some holiday cards with you all! 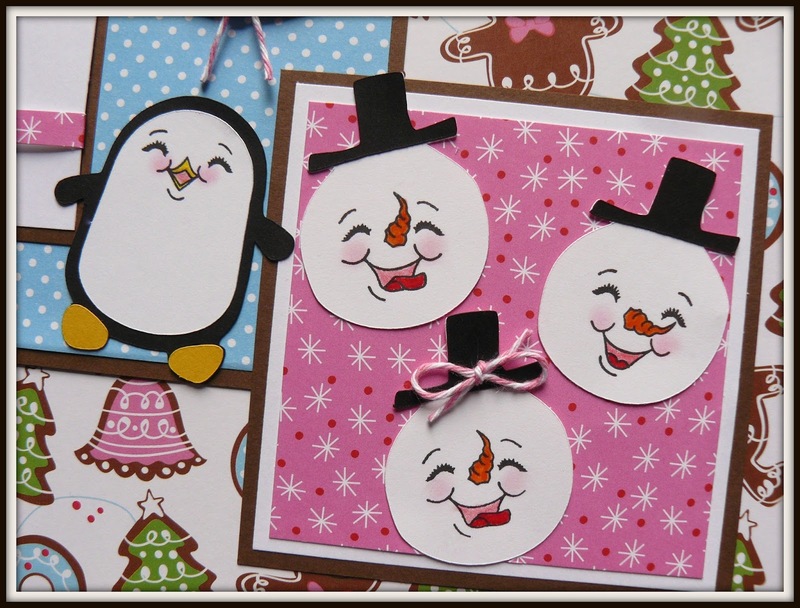 cards bring some crafty holiday spirit to your day as well! Please visit our blogs for more details on each creation. Merry Christmas Eve! 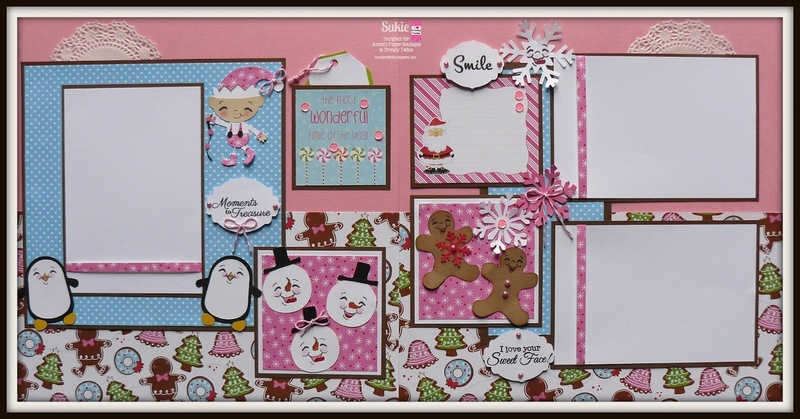 This is Sukie and I have a fun and whimsical layout to share in anticipation of some sweet Christmas pictures tomorrow. 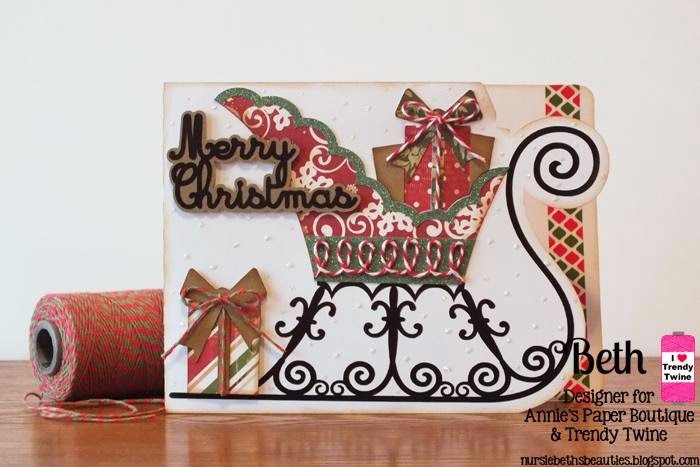 Over the past month as I was working on my holiday creations, I stashed away some extra die cuts for this layout. The gingerbread men were cut from Just Because Cards, the elf from Jolly Holidays, the penguins from Simply Charmed and the snowmen heads from Joys of the Season. I used Peachy Keen Stamps for their adorable faces. A die from my stash was used for the sentiment tags. All of the sentiments are from the Scrappy Moms Picture Perfect stamp set. The sentiment tags were accented with some pearl stickers. My layout was embellished with touches of Tickled Pink Trendy Twine. It was the perfect accent for my non-traditional layout. The snowflakes were created from different punches in my stash. 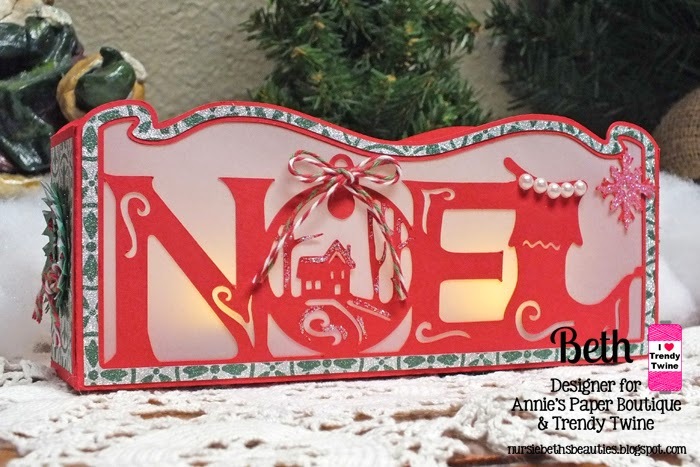 I added a few pink sequins from Annie's Paper Boutique to each of the pages. Don't forget to stop by the store to check out all of the amazing twine colors, many are still on sale this month. You will also find lots of products for all of your crafting needs. Thanks so much for stopping by and have a Merry Christmas. We hope to see you back here tomorrow for a special Christmas Day post! Hi everyone! I'm Helen from HTB Creations. 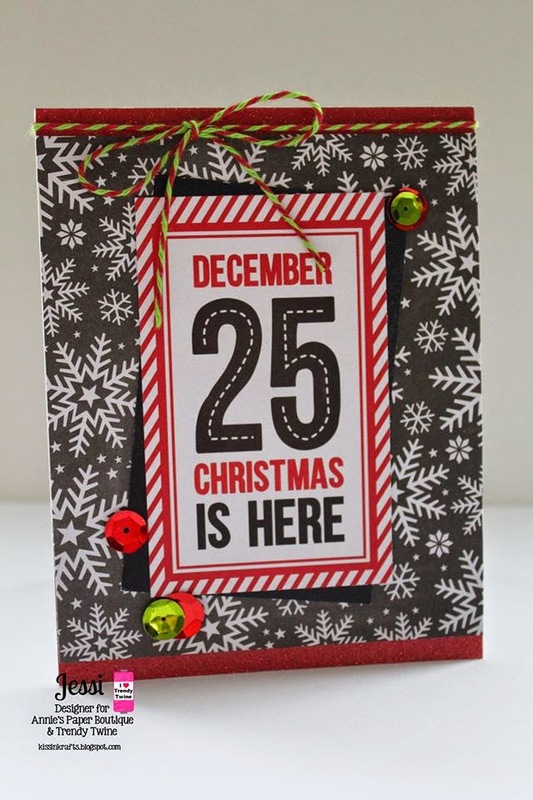 Can you believe it's almost Christmas Day? Time sure does fly. I did not mail out any Christmas cards this year, again. But I have made some that I can give out with the gifts I am passing out. 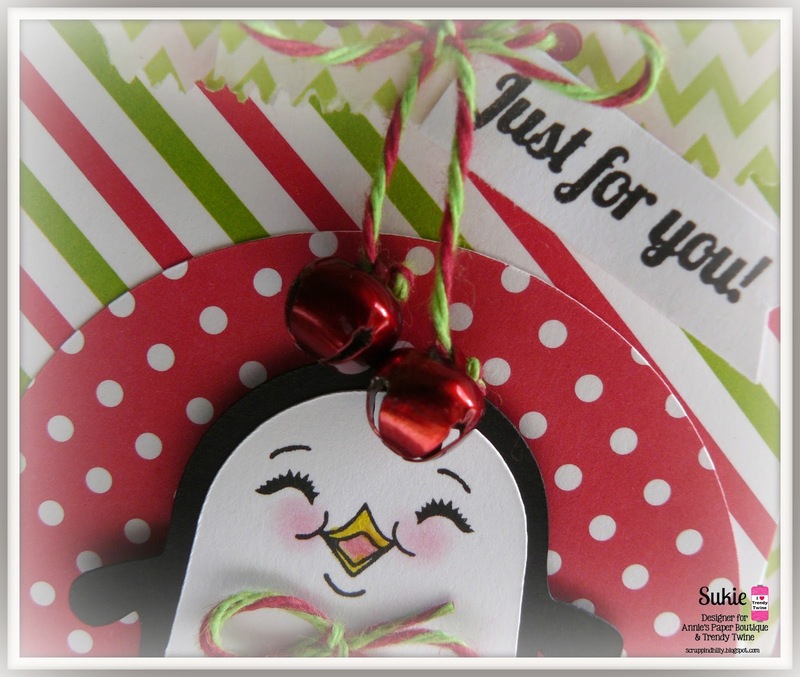 Here's a fun santa owl card that has some yummy Candy Cane Trendy Twine on it! The owl is from Cricut Create a Critter 2--cut at a little over 3 inches. I tied a bit of twine around the hat and then decided to glue the twine onto the scarf--I do like that look. The stamp is My Pink Stamper and then I used some fun sequins. We still have lots more fun this month, so be sure to keep visiting! 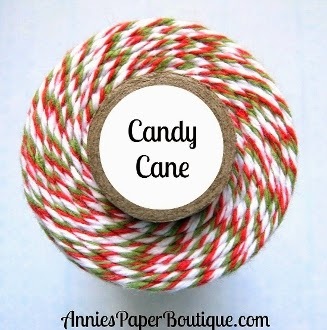 And you can still get the holiday twine on sale at Annie's Paper Boutique along with tons of other fun goodies. Hello this is Sukie and I have a simple project to share. 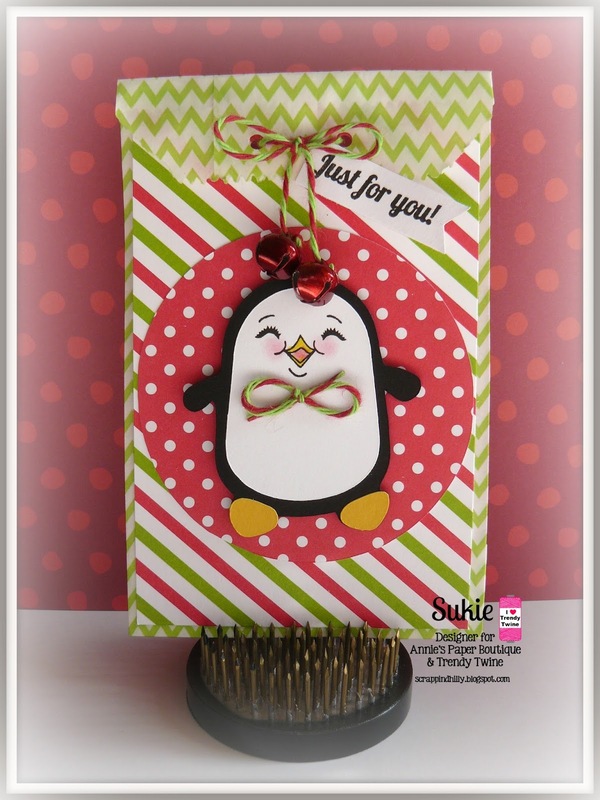 I created a gift card holder using a lime chevron bag from Annie's Paper Boutique. I simply layered it with some fun papers, folded the top over and tied a cute bow with Cherry Limeade Trendy Twine. I added a couple of jingle bells to the twine. A sentiment tag using the Scrappy Moms Mini Messages stamp set was tucked under the twine. The penguin was cut from the Simply Charmed cartridge. 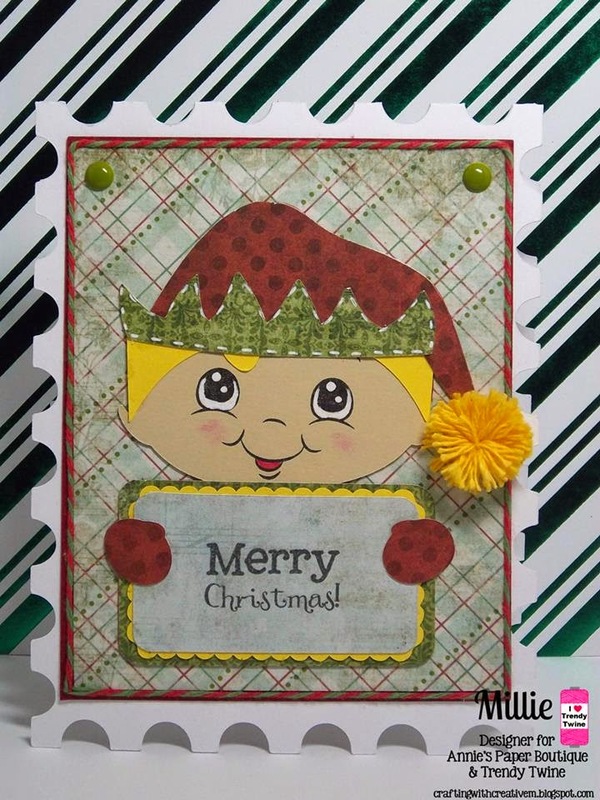 I stamped his face with a Peachy Keen Face stamp and added a cute little twine bow to him. Check out the store for these adorable bags, they come in several fun colors. There is still time to purchase some holiday twine and lots of other fun packaging! Good morning Trendy Twiners! 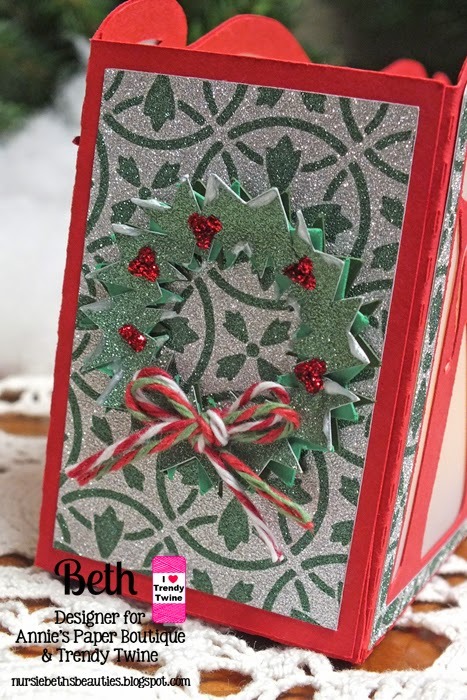 Beth from Beth's Beauties with a beautiful project that you could give as a gift or keep as a centerpiece throughout the Christmas season. 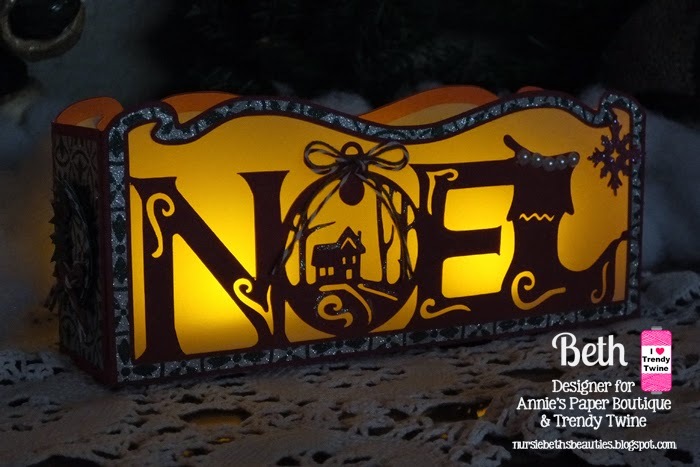 This luminary was created from the English Cottage kit at SVG Attic. I used Holly Berry and Cranberry Trendy Twines on it. Instead of using a paper bow on the wreath, I used twine! 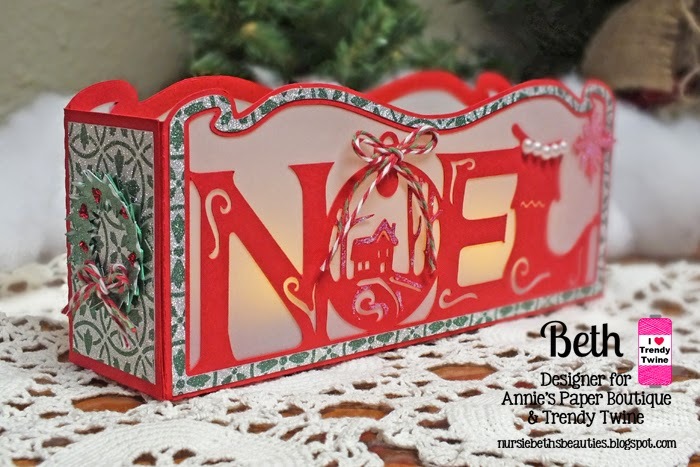 The front view gives you an idea of how pretty it looks with the word "NOEL" spelled out in word art. Here is a closeup of the "O" ornament to which I added the twine bow and stickles. Last, but not least, here is what it looks like all lit up! I used two electric LED candles in it. Hey all! 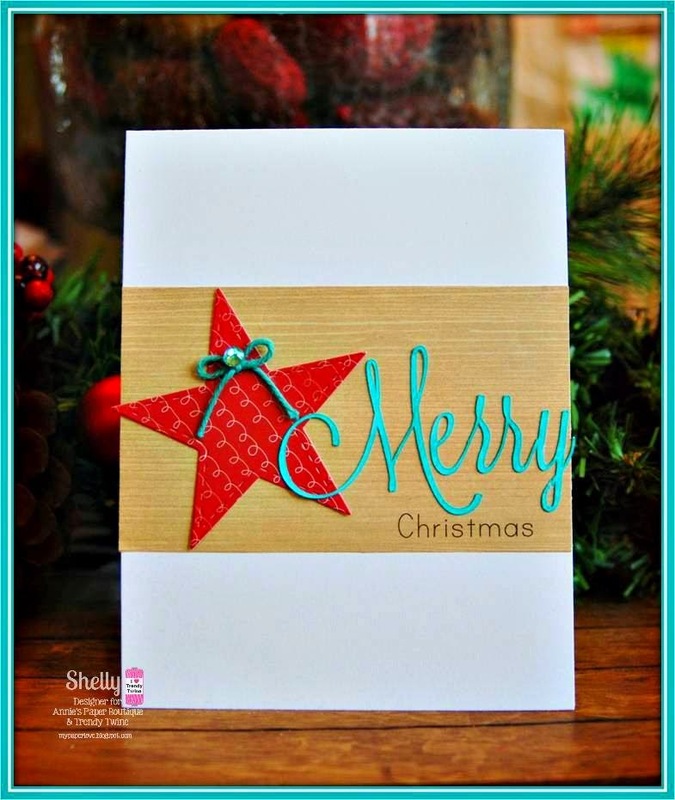 It is Melissa from M Miranda Creations sharing another project using Holly Berry Trendy Twine today. There have been so many great projects this month. I hope you have found some Trendy Christmas inspiration. Wow, it is the Saturday before Christmas! The big guy makes his rounds around the world in four days! Today, I have one more last minute Christmas card for you. 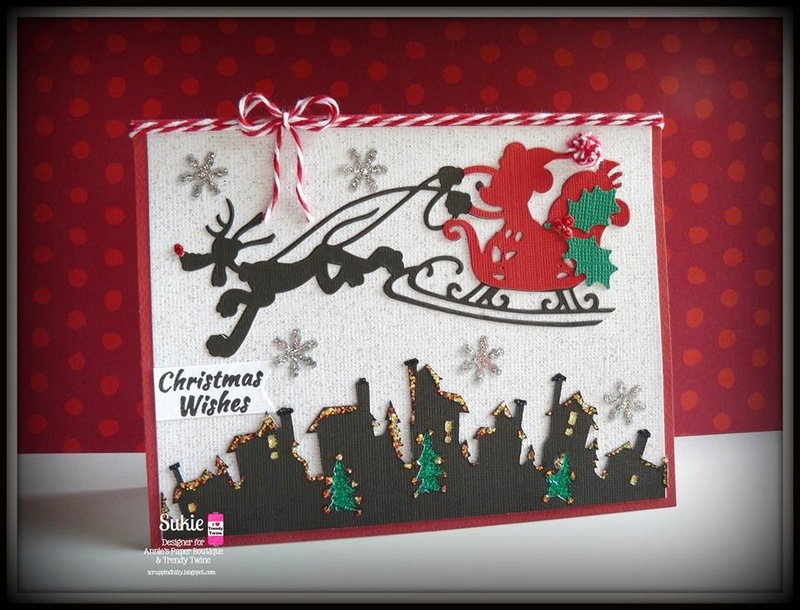 Using a cut file from KaDoodle Bug Designs called Holly Bear, I put together this 4"x 4" card. I opened up my Designer Edition software for my Cameo and drew the square background piece. I then used my square to size my cut file. There was a piece of the cut file that I did not want to use, so I did a little altering as well. Once I was able to make it look the way I wanted, I cut out my pieces and inked them. Then after assembling the bear, I put together my base using Vintage Cream cardstock from Papertrey Ink and patterned paper from My Mind's Eye. I used the Holly Berry Trendy Twine to wrap around the base three times and also to attach my tag by tying it on with the bow. 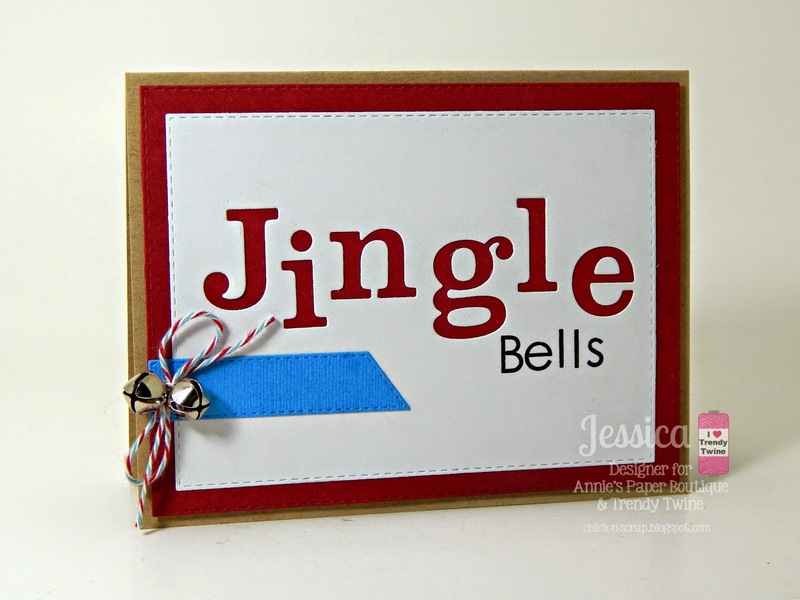 The sentiment is from My Craft Spot's Tiny Tags Christmas set. Very easy and so very cute! Here is a look at our Holly Berry twine! If you would like to shop, click here. And join our Twine it Up Facebook group here. It's nearly here! Are you ready? 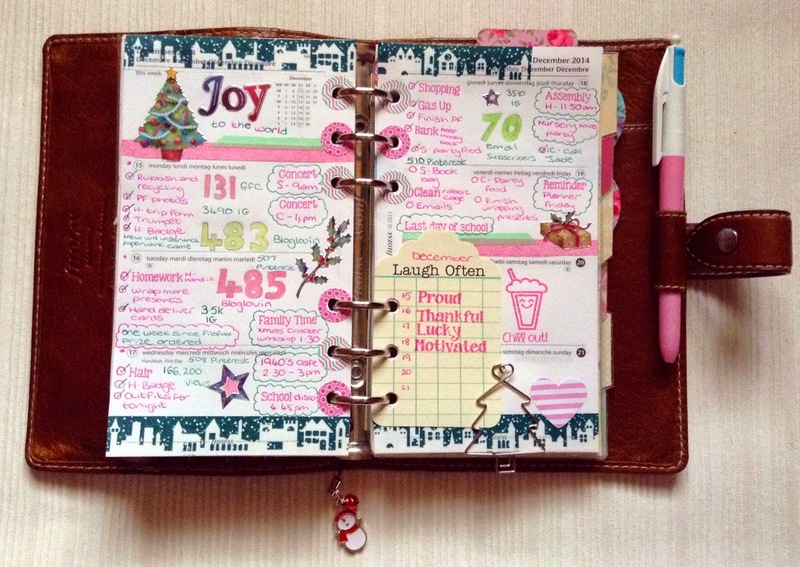 I am ridiculously excited about Christmas and I've had a lot of fun decorating my planner pages this month with Christmassy themes. I have been so busy getting things ready, I don't think I would have completed it all if I hadn't written it down to keep me on track! 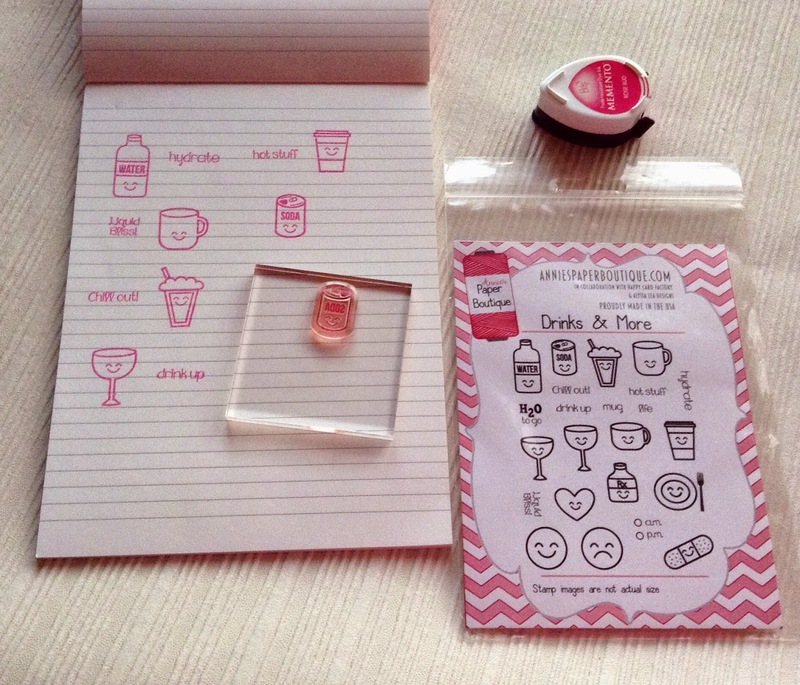 I was really excited to receive these Drinks & More planner stamps last week. They are so adorable and they've been on my wish list since they first became available in the store. 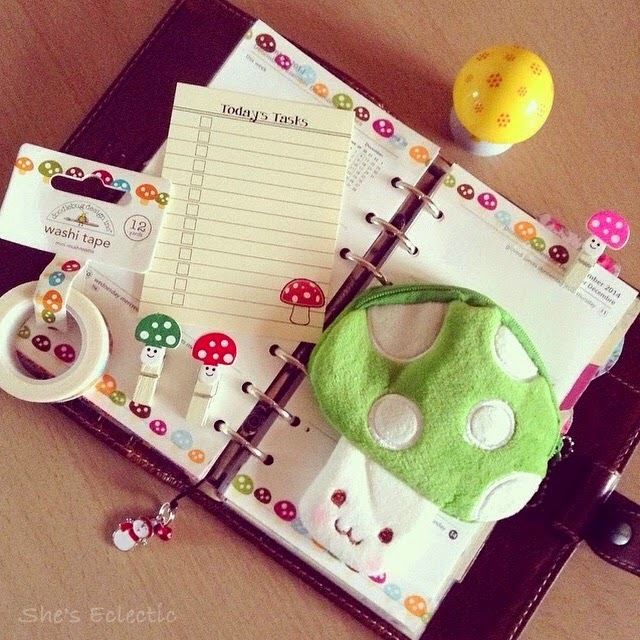 I am a huge fan of anything cute/kawaii so these are perfect for me to use in my Filofax! So far I have only used them for decoration but they are practical too with stamps to remind you to "hydrate", an "am/pm" check box and some fun ones like "hot stuff", "chill out" and "drink up". I am going to keep playing with this set and show you some more ways you can use them in my upcoming posts next year. So this is how my week is shaping up now. I knew I would need quite a bit of space for my to do lists so I used a Journalling Tag to record how I am feeling instead of stamping on my diary pages. 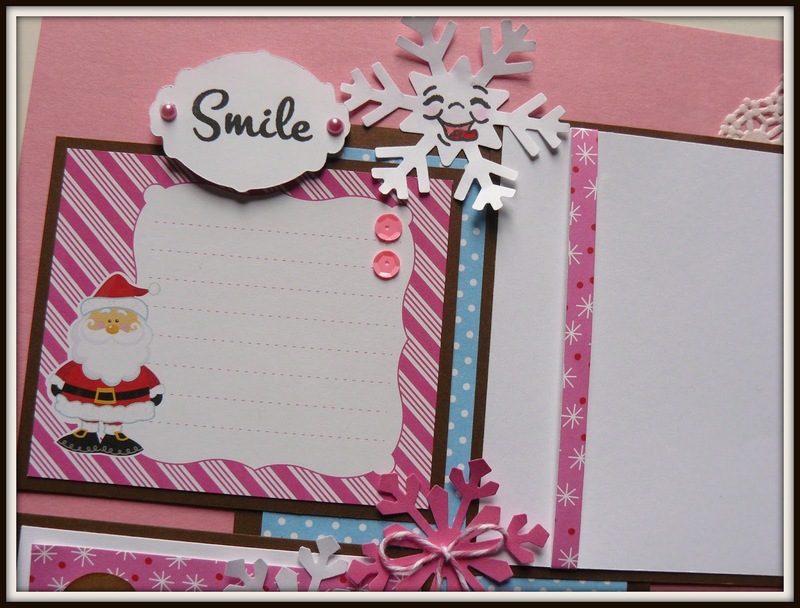 I really like how neat and tidy it looks using the Feeling Happy and Feeling Funny stamp sets! 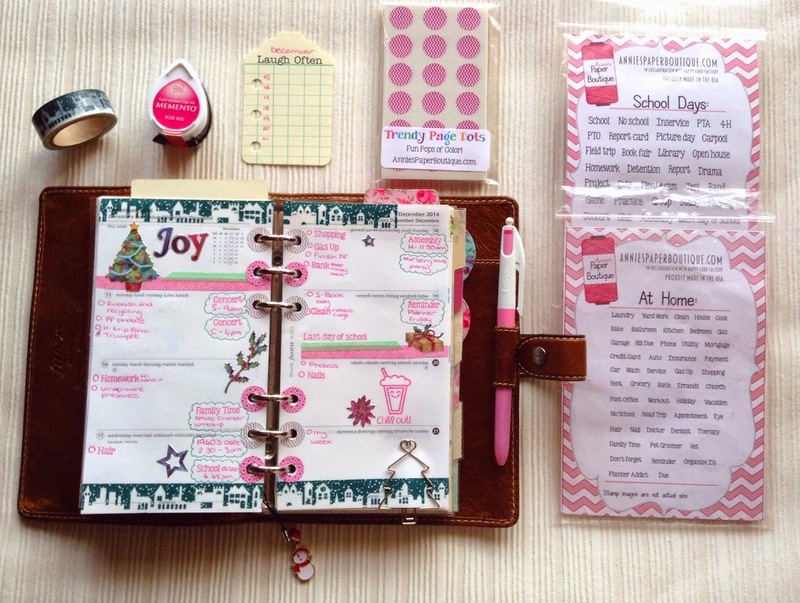 Well that was the last Planner Friday post of 2014! I hope you have a wonderful Christmas and a very happy new year and I will see you again in January! and I am so excited to be sharing another project with you all! The countdown has begun, the frantic mad rush to get your last minute Christmas shopping done and for those of you with kiddo's at home this always seems to be the last... last... last... minute finishing touches that need to be completed before the Jolly Santa comes for a visit. How adorable and super fun is this???? For those of you who don't know, I LOVE to work with vinyl (most of my ETSY shop is all vinyl items) so when I was trying to come up with a Christmas project to share, going through my stash of products from the Trendy Twine store, I found this adorable Plastic Milk Bottle. 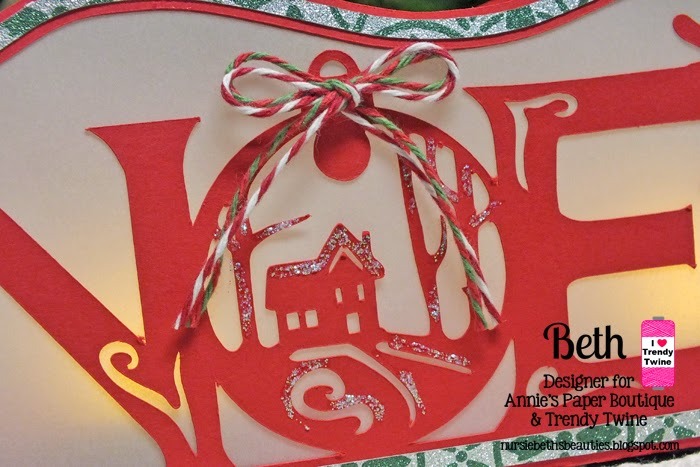 Using vinyl from my scrap bin and my cameo, I cut out the "Milk for Santa" sentiment in matching colors to the Peppermint Icicle Trendy Twine. Then I stuck in one of the fun red and white polka dot Paper Straws. So there is my project. What do you think????? There is still time to place those orders to make one of these "Milk for Santa" bottles for your home. I am sure Santa would LOVE to see this next to his cookies! I hope you have enjoyed my project and have a great Wednesday!